The HD-7P is a 7,000-lb. capacity, narrow-configuration four-post lift. This model offers compact convenience, so it also helps maintain an open, fresh appearance in more spacious garages. The HD-7P does not require a special foundation, nor does it involve complicated installation procedures. It's simply the perfect service lift for shops or garages with limited floor space. 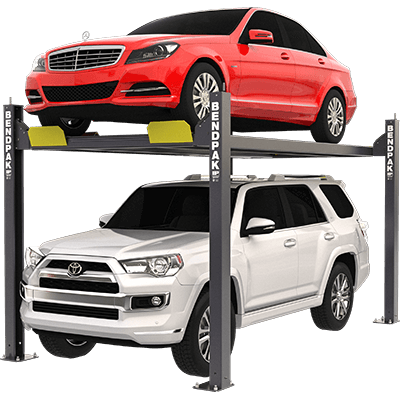 This four-post lift is about the size of a typical parking space and fits nicely as a residential or commercial parking lift. The applications are endless, but what else would you expect from BendPak? After being in this business for over 50 years, our reputation is as solid as our lifts. If you've ever owned a BendPak four-post lift, you know that means a lot. Watch review from Woman.Driven on the HD-7 four-post lift! Get the most out of smaller spaces and compact vehicles with BendPak’s HD-7P. This narrow lift shaves 10.5” off the overall width of a standard-size model, which makes for slightly narrower space between the columns too. If you want a 7,000-lb. capacity four-post lift but can’t sacrifice the precious inches taken up by the wider HD-7W, this is the car lift for you. Store classic cars, racers and compact vehicles comfortably and safely. Four heavy-duty stainless steel lifting wire ropes and a single hydraulic cylinder mounted underneath the runway make this lift the most durable, maintenance-free lifting system on the market. BendPak's over-engineered designs reduce stress and fatigue on the axles, sheaves and wire rope. We insist on using dual-hub wire rope sheaves when appropriate because they ensure that a safer, higher-quality product. With BendPak, total peace-of-mind comes standard with every lift. Each four-post lift is equipped with multiple lock positions for variable-height parking. Pneumatic push-button controls will simultaneously release all four independent safety locks. The car lift structure is outfitted with four high-quality stainless steel lifting wire ropes that are rated at 14,400 lbs. each. The combined rating of the rope is more than 822% of the entire lift’s maximum lifting capacity! And we make sure it looks tidy too—all wire rope is fully enclosed within the lift structure. We incorporate maintenance-free electric-hydraulic power systems into each lift for ultimate dependability, and all controls are conveniently located within close reach. 10" x 12" base plates provide a solid foundation for the HD-7P. Your four-post lift will be stable and secure for as long as you own it. Optional 4-piece caster kit makes your lift portable, with or without a car situated on the raised platform. For your safety and convenience, the wire ropes, airlines, safety latches and sheaves are all fully enclosed within the car lift columns. The low, 4.5" high runways on this four-post lift are made to accommodate low-bodied sports and race cars, as well as mid-size sedans, light trucks and virtually any vehicle under 7,000 lbs. The approach ramps were designed a little longer to help when loading low ground-clearance vehicles. It's the little bit that makes a big difference. Aircraft-quality stainless steel and aluminum pneumatic cylinders release all four locks simultaneously with the simple push of a button. The spring-loaded safety locks automatically engage continuously as the lift is raised. For added safety, a secondary lock system acts as a slack-cable device that engages in the unlikely event of wire rope failure.